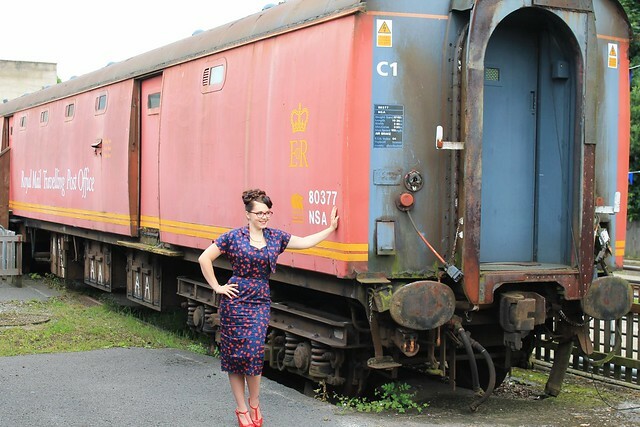 Last week I had the pleasure of visiting the Kirklees Light Railway, a lovely little place in Clayton West – perfect for a little trip out. 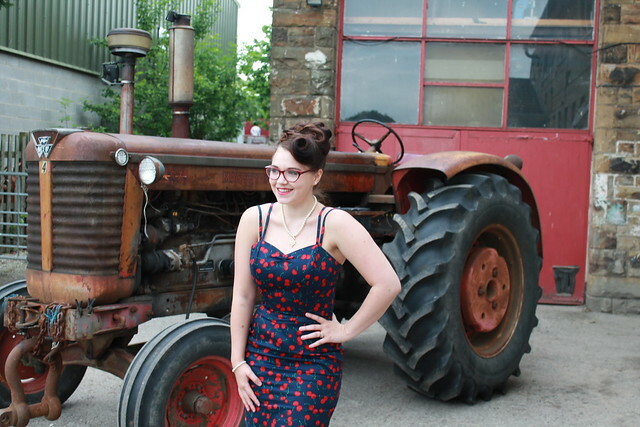 I was really excited to be wearing the Bombshell dress by Vivien of Holloway. 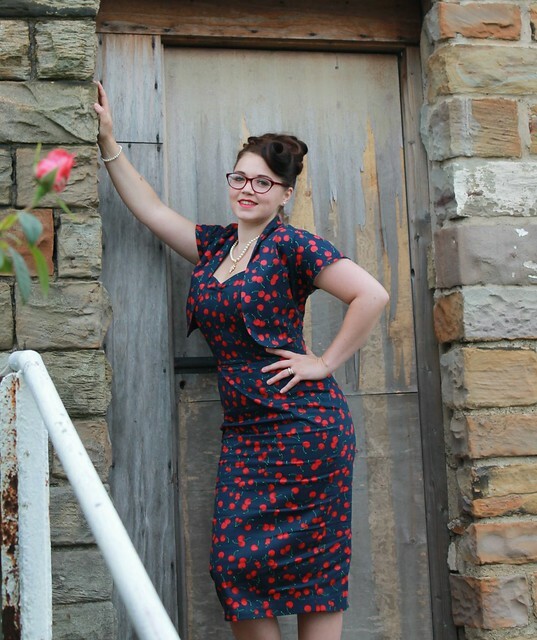 I chose the Bombshell dress in Cherry Print to review because I was immediately drawn to its figure hugging shape and fun loving print. 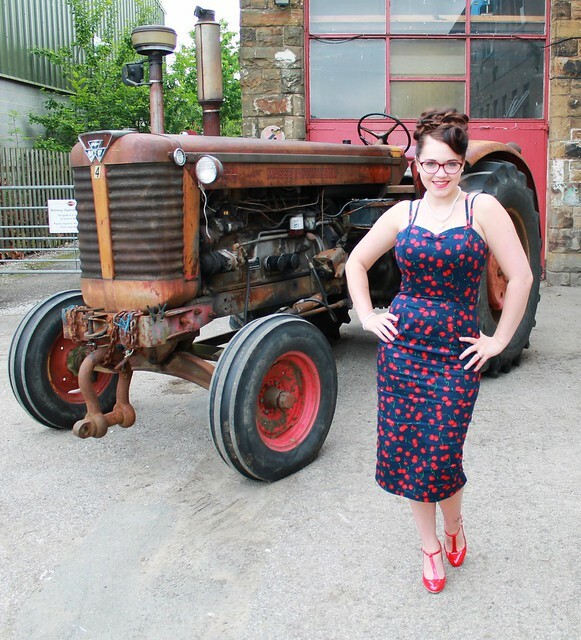 I was also taken by the matching bolero and true to its name – it really does make you feel like a Bombshell! Vivien of Holloway is known for vintage sizing and I adore that they go by real old time measurements. 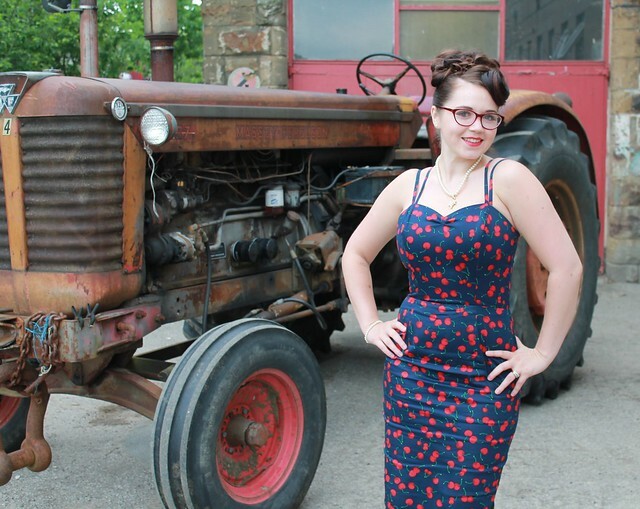 Back in the day, ladies curves were almost definitely of the hourglass variety and Vivien of Holloway celebrates femininity and shapes in all sizes. Vivien of Holloway sent me a size 14 and size 16 initially. The size 14 fit but had a bit of room to move in, so they also sent the size 12. This absolutely fit like a glove and as soon as the dress on, the way the fabric formed to my shape was a dream. The top of the dress has a boned and fitted bodice, which contributes to a structured fit. The sweetheart neckline is really flattering and the split at the back of the dress shows off just enough leg. The straps of the dress are set apart from each other so that when worn, one slightly adorns your shoulder and the other elegantly holds everything in place. There is also a zip fastening to the back. For me personally, what I relish about this dress is the form. The waist measurement is nipped in which allows a true hourglass shape to shine. 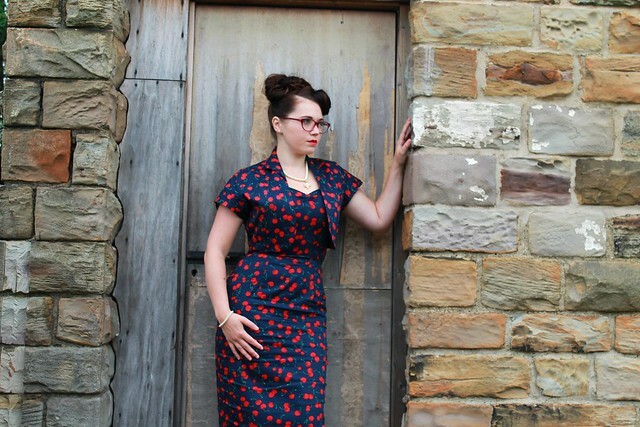 Whenever I am shopping for vintage, I often find that because the waist is mostly smaller than the hip to bust ratio, it can be hard to find a good fitted piece. 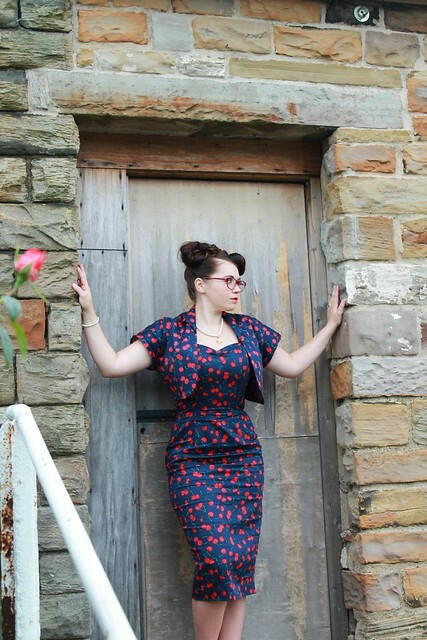 I normally need to visit a vintage tailor to have it taken in at the waist or let out at the bust/hips. Having found Vivien of Holloway however, all my vintage dilemmas have been solved. I chose the “cherry” print because I thought it was really subtle yet still “stand out” – my only regret is that I do not have a large cherry fascinator to match this rather fabulous outfit. The full outfit wears very well, I was able to move around comfortably and the fabric really did stay relatively crease free throughout the day. The matching bolero jacket really finishes the dress off in the most beautiful way. The “boxy” shape shoulders and cropped fit leaves a stunning silhouette. There is no button or fastening to the bolero jacket but due to the high quality tailoring, it sits really well when worn and doesn’t need to be fastened. I paired this outfit with patent red Mary Janes with a low heel and buckle fastening. Vintage pearl necklace and bracelet completed this look. I like to keep my accessories simple and normally let the outfit do all the talking. 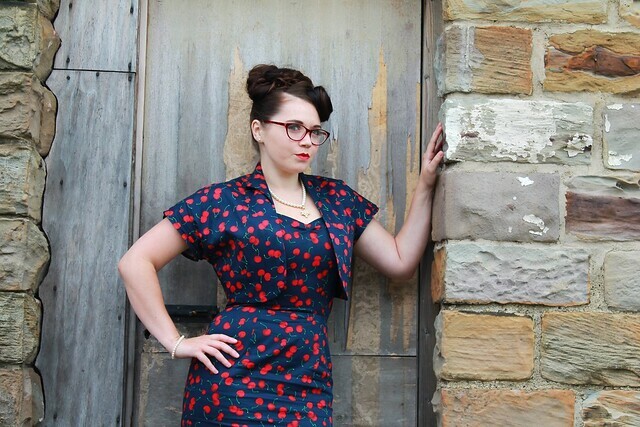 This true 1950’s “Bombshell” shape is so flattering, especially for girls with curves. 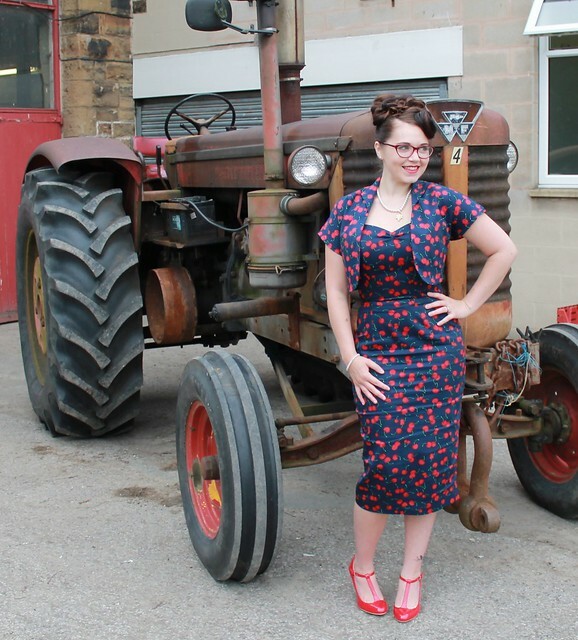 This dress set is the “navy cherry” print but this style also comes in a number of other different patterns and colours. What an absolutely glorious dress. It suits your curves so well. If I purchase this is it guaranteed to make me look this good too! Love your look Georgia! 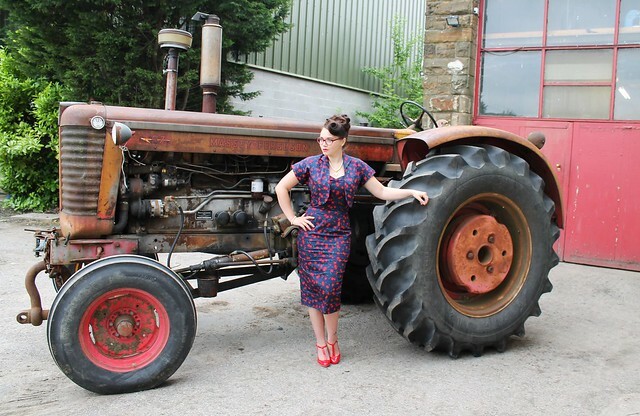 This is when you look the hottest in nice fifties dresses and stood by a big tractor hahaha.